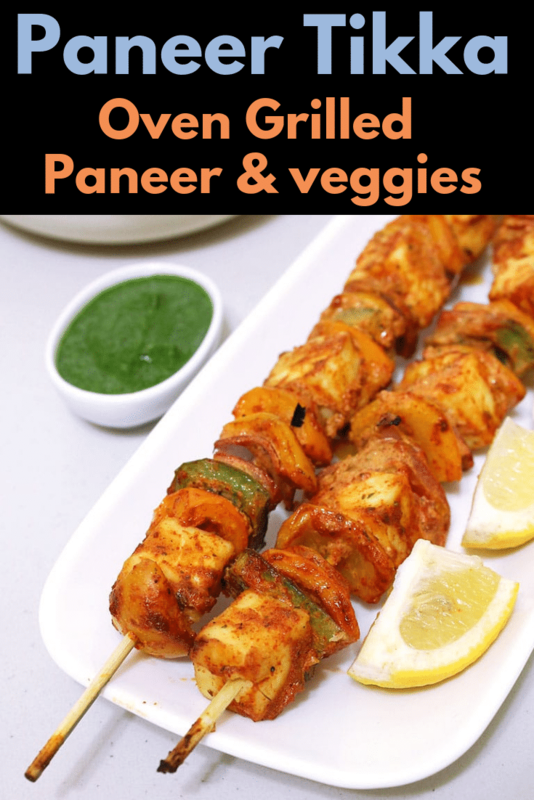 Paneer tikka recipe – popular Indian starter or snack that can be made at home very easily. I have shared two methods: in the oven and on the stove top. Whenever we (I and hubby) go to the North Indian restaurants, we always order paneer tikka as we both love and enjoy eating it. But first time I made it at home, it was an year ago. It tasted really good exactly like the restaurant one. After that I have made it 2-3 times and all the time we enjoyed it. 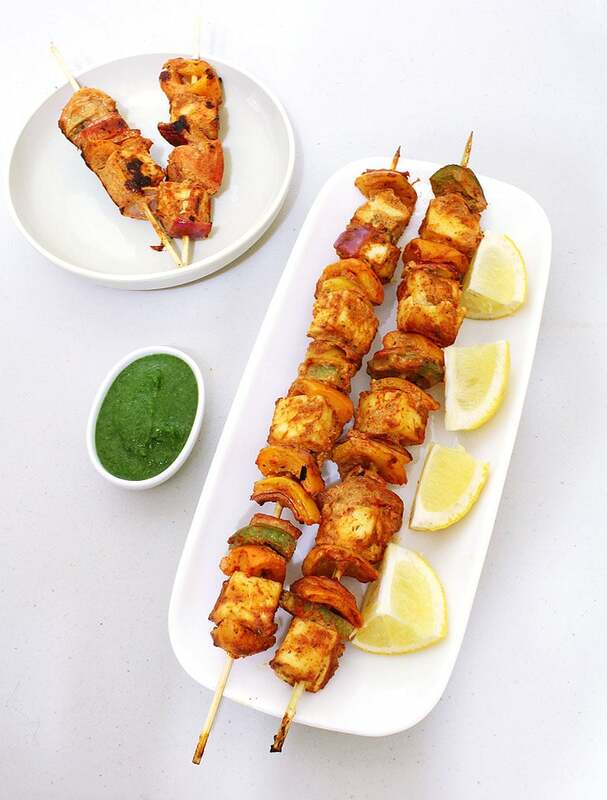 This is dry paneer tikka recipe. There is another variation is paneer tikka masala – dry tikka is simmered in creamy gravy. If you are not familiar with this: marinated paneer cubes and veggie pieces are grilled in tandoor (clay oven). So basically this is called tandoori paneer tikka recipe. But at home we do not have tandoor, so we will be making it without tandoor and you will not have to compromise the taste and texture. You can grill or barbeque the tikkas or you can use grill pan. But I have made in the oven and also in non-stick pan on stove. The marinade is made from hung curd and many different spices which makes it so flavorful and yummy. Marination time is at least 2 hours but I recommend more that 2 hours or overnight, actually more the better. I kept it for about 6-7 hours in the fridge. More the marination time, flavors will get chance to mingle. You can use homemade paneer, here I have used store bought (I am short on time). Addition of veggies are as per your choice, I have used red, green and yellow peppers, onions and tomatoes. You can skip any or use other like broccoli, mushroom. But I would say keep onions and green pepper. This will add some crunchy and fresh flavors with soft paneer. 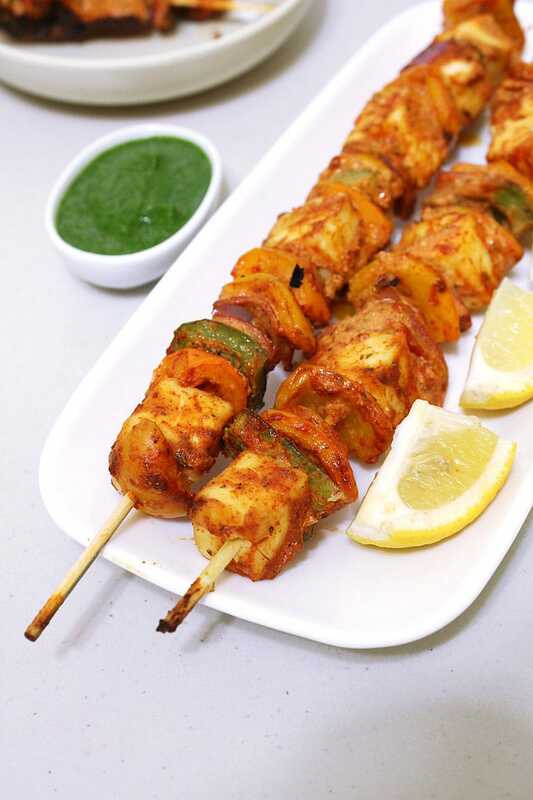 To get the restaurant style paneer tikka color, I have not added any artificial color. Instead I have used kashmiri red chili powder. You can always add more till you get nice red color because Kashmiri chili powder is not spicy compare to regular chili powder. So you can add a teaspoon or so more to get more red color. 1) Take yogurt in muslin cloth or man’s handkerchief, put it in the strainer and keep a bowl or jug under it to collect excess water. Keep this in the fridge for about an hour and let all the water drain out. 2) and You will left with thick, hung curd or yogurt in the cloth. 1 cup of yogurt will give ½ cup of thick yogurt. Take thick or hung curd in a bowl. 3) Add all the spice powders (kashmiri red chili powder, cumin powder, coriander powder, chaat masala, garam masala, aamchur powder, fennel powder, black pepper powder and kasuri methi) along with salt. 5) Add ginger paste and garlic paste. I have added freshly grated. 7) Cut veggies into 1 inch pieces and cube the paneer. Make sure that size of veggie and paneer pieces are same. 8) Add it to the prepared marinade. 9) using your clean hand, gently mix. All the pieces should be coated with marinade. 10) Cover it with plate or plastic wrap and let paneer and veggie marinade in the fridge for at least 2 hours. More the better. 11) If you are using wooden skewers like me then submerge in the water for 10-15 minutes before using. 12) At the time of using, wipe them using towel or paper napkin. If using metal skewers, no need to soak. 2) Line a baking tray with aluminum foil. It is optional but I like to do it for easy cleaning later on. Grease the foil or tray with oil or spray it with nonstick cooking spray thus tikka will not stick. 4) Brush the generous amount of oil, flip the tikka and also apply on other side as well. Please be generous while using oil because paneer tends to dry out while baking in the oven, this oil will keep it moist. 5) Bake in the pre-heated oven for 10-12 minutes. remove it, flit it and again brush with oil. 6) Again bake it for 10-12 minutes. 7) they is ready to serve. 1) Brush the tikka with oil from all the sides. 2) Heat the non stick tawa on medium heat. Once hot place the skewer on the tawa, shallow fry them. 3) turn it and cook all the sides till it is golden brown about 2-3 minutes. Now remove it to serving plate. 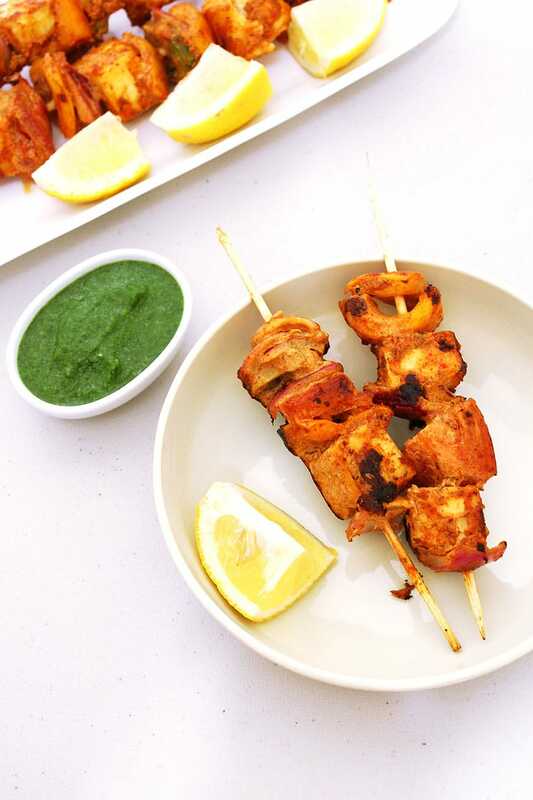 Serving suggestion: Serve tandoori paneer tikka as an appetizer or starter with lemon wedges and mint-coriander chutney on side. Let it marinate at least 2 hours or more. If you have time than keep it overnight. As it bakes in the oven, paneer tends to get dry. So always be generous in oil while brushing. Do not over cook paneer otherwise it will get tough and rubbery. So keep mentioned temperature and time. It will make soft and succulent paneer. If making on tawa then always use non stick tawa. the one made on tawa or stove top will be little crispy from the outside unlike the baked version. Make this easy tandoori paneer tikka with homemade marinade. This can be grilled into the oven or made on tawa on stove top. Take yogurt in muslin cloth or man’s handkerchief, put it in the strainer and keep a bowl or jug under it to collect excess water. Keep this in the fridge for about an hour and let all the water drain out. and You will left with thick, hung curd or yogurt in the cloth. cup of yogurt will give ½ cup of thick yogurt. Take thick or hung curd in a bowl. Add all the spice powders along with salt. Mix it well. Cut veggies into 1 inch pieces and cube the paneer. Make sure that size of veggie and paneer pieces are same. Add it to the prepared marinade. using your clean hand, gently mix. All the pieces should be coated with marinade. Cover it with plate or plastic wrap and let paneer and veggies marinate in the fridge for at least 2 hours. More the better. If you are using wooden skewers like me then submerge in the water for 10-15 minutes before using. At the time of using, wipe them using towel or paper napkin. If using metal skewers, no need to soak. Arrange the veggies and paneer on the skewer or toothpick. order does not matter, but keep each veggie pieces between two paneer pieces. Pre-heat the oven to 350 degree F or 180 degree C for at least 10 minutes. Line a baking tray with aluminum foil. It is optional but I like to do it for easy cleaning later on. Grease the foil or tray with oil or spray it with nonstick cooking spray thus tikka will not stick. Brush the generous amount of oil on all sides of tikka. Bake in the pre-heated oven for 10-12 minutes. remove it, flit it and again brush with oil. Again bake it for 10-12 minutes. Brush the tikka with oil from all the sides. Heat the non stick tawa on medium heat. Once hot place the skewer on the tawa, shallow fry them. turn it and cook all the sides till it is golden brown about 2-3 minutes. Hi. kanan wonderful presentation and it is easy to prepare. I will definitely try this Paneer Tikka recipe. Sure. Hope you like it. I tried the tikka today, it came out great! Kudos in the amazing recipe and thank you so much for the very well detailed instructions and images. Unfortunately it did not work out so great in the baking oven, so I used a pan. It took a lot of oil, I pretty much shallow fried it, but the end result was very professional and looked like what they served at restaurants. 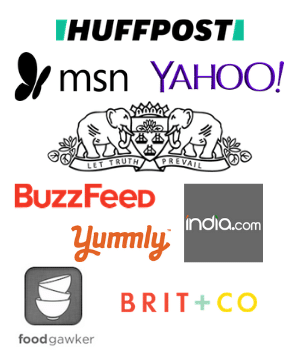 I tried these recipes and it tastes just awesome. I absolutely loved these recipes I also recommend everyone to try these recipes at least one time you will love it. Thanks for sharing these recipes. Happy to know that it came out good and you liked. Thank you for the feedback and for you kind words. HI .. just read your paneer tikka recipe.. i do it the same way .. but as soon as i put it in the oven.. the marinade releases water (because of the curd maybe), which somehow changes the taste a bit. to avoid the watery part, we are using strained and thick yogurt. It is not a good idea to use the yogurt directly from the container. the whey or watery part must be strained through cotton cloth or muslin cloth.